Ultrasound screening of the abdomen prior to CT has been shown to reduce the need for abdominal CT scans without missing significant injuries. 27 Currently, there is insufficient reported experience to recommend its routine use in the evaluation of pediatric trauma patients. The general approach to evaluation of the abdomen in a child is outlined in Fig.,,,,2.44-1. FIG. 244-1. 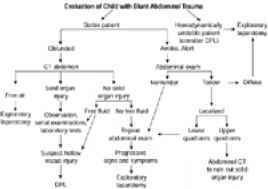 Management algorithm for a child with suspected blunt abdominal injury. In an alert child, we heavily rely on the presence or absence of abdominal tenderness when making decisions for further evaluation. 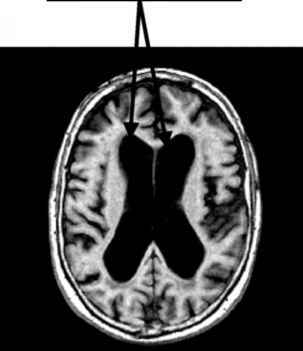 In a child with a closed head injury, an abdominal CT scan gives the most information but does not exclude hollow organ injury. Abbreviations: CT, computed tomography; DPL, diagnostic peritoneal lavage. SPLENIC TRAUMA The spleen is the most commonly injured abdominal organ in children. Children are more likely to be hemodynamically stable than adults even with the same degree of splenic injury.26 Children with splenic injuries are more likely to be managed nonoperatively than adults. 26 Several reasons are thought to explain this difference. The spleen in children has a thicker capsule. There are larger amounts of elastin and smooth muscle in both the capsule and the splenic vessels. Children tend to have lower-velocity injuries and overall lower Injury Severity Scores. 26 Children who are more likely to require operative intervention include those with a higher Injury Severity Score, an injury sustained in a motor vehicle crash, or a greater amount of hemoperitoneum. Any child who requires a splenectomy should receive pneumococcal vaccine to prevent postsplenectomy sepsis. HEPATIC TRAUMA The liver is the second most commonly injured abdominal organ in children. Similar to splenic trauma, these injuries can often be managed conservatively. The rate of fatal hemorrhage is higher with hepatic injury than with splenic injury. Diagnosis is often made by abdominal CT scanning in stable trauma patients. Unstable patients often require operative intervention to control hemorrhage. PANCREATIC TRAUMA Although pancreatic trauma is uncommon in children, occurring in less than 10 percent of blunt trauma patients, trauma is the most common cause of acute pancreatitis. Handlebar injuries are the most common mechanism of injury and often cause isolated pancreatic trauma. 29 A high index of suspicion is required because symptoms are often delayed and morbidity is related to delay in diagnosis. Serum amylase levels are often elevated, but the degree of elevation does not correlate with the degree of pancreatic injury.29 Serum lipase levels have not been studied in children. CT scanning has at best an 85 percent sensitivity to identify pancreatic injury in the acute setting.29 Sensitivity is highest when both oral and IV contrast are used. Children with abdominal pain and an elevated serum amylase require an abdominal CT scan and should be hospitalized for observation even if the CT scan findings are normal. 29 Complications of pancreatic injury include pseudocyst formation, acute pancreatitis, and relapsing pancreatitis. BOWEL TRAUMA Intestinal injuries occur in less than 5 percent of children with blunt abdominal trauma. The jejunum is most frequently injured, followed by the ileum and cecum. The duodenum is particularly prone to the development of hematomas in the wall, leading to obstruction. The physical examination is often quoted as being unreliable in diagnosing bowel injury following blunt trauma. Children with abdominal wall injuries (bruising or abrasions), tenderness on palpation, or a mechanism of a direct blow to the abdomen require further investigation to rule out bowel injury. In hemodynamically stable patients, a contrast-enhanced CT scan can often increase the suspicion of a bowel injury. CT scans are diagnostic for bowel injury in only 25 percent of cases. Pneumoperitoneum or extravasation of enteral contrast is considered diagnostic of bowel injury and requires immediate laparotomy. Nondiagnostic findings include free peritoneal fluid without solid organ injury and bowel wall enhancement or thickening. A child with a tender abdomen and these nondiagnostic but suggestive radiographic findings requires an exploratory laparotomy or DPL to rule out an intestinal perforation. 28 Complications of bowel injury include peritonitis, obstruction, and intestinal strictures. Bowel injury is associated with seat-belt use in less than 5 percent of children admitted to trauma centers. A particular entity, the lap-belt complex, consists of intestinal or mesenteric injury with a concomitant lumbar spine injury due to a lap belt. It has also been shown to occur with three-point restraints (lap belt/shoulder-harness restraints) when the lap belt is incorrectly positioned over the abdomen. The intraabdominal injury often occurs at the midlumbar level. Most commonly, the jejunum is injured. Any child with a lumbar fracture or an anterior abdominal bruise from a seat belt must have a thorough search for intraabdominal injury. If a spinal injury is present, but the CT scan is negative, the child should be admitted for observation or a DPL should be performed.